We propose a compact electrical-cell-substrate impedance sensing (ECIS) system. The ECIS system measures the amount of microorganisms cultivated in an incubator and monitors it in real time. This is based on the measurement of the AC impedance change of a small gold-film electrode on a culture well. In the existing system, except for sensors for impedance measurement, we needed external equipment such as a lock-in amplifier and a personal computer. Also, the sensors inside the incubator and the systems on the outside were connected by a wire. These make the laboratory complex and the system difficult to install. 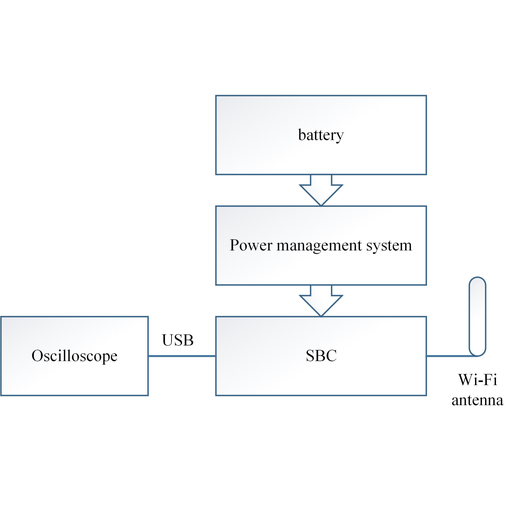 In this study, we implemented a small integrated ECIS system with a recent USB oscilloscope, a battery, and Wi-Fi technology to solve the above problems. System integration allows the entire system to be placed in an incubator, eliminating the need for external systems. Also, it is easy to carry and install it because of its simple structure. A Wi-Fi antenna was used to provide network connectivity inside the incubator to provide a web interface for status monitoring. The system is in the power-saving mode except when measuring to save on battery power. Experimental results on the relationship between measurement interval and battery capacity are given. Chan-Young Park, Jae-Hong Min, Yu-Seop Kim, Hye-Jeong Song, and Jong-Dae Kim, Development of Portable Electrical-cell-substrate Impedance Sensing System, Sens. Mater., Vol. 31, No. 2, 2019, p. 253-259.